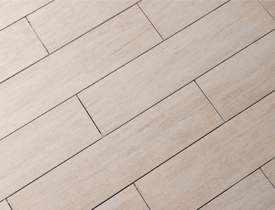 Did you know that there is ceramic and porcelain tile that looks like wood? This new type of flooring come in a variety of colors and grains, simulating virtually every type of wood, including chestnut, maple, oak, mahogany and teak. Depending on the quality of the tile, it can be very hard to tell at a glance that the flooring is ceramic instead of wood. Some tiles even come with an aged or "distressed" look if you are looking for an old-fashioned style -- but with far more durability. Other tiles that look like wood may create a sleek and contemporary feel. You can place the tiles in traditional hardwood flooring patterns or create your own distinctive pattern. If you are a fan of hardwood floors, that might be the way you want to go when choosing new flooring. However, if you choose ceramic tile that looks like wood, you have a number of additional benefits. Ceramic tile that looks like wood is not only easy to clean, but easy to sanitize, making it a perfect choice for a kitchen or bathroom. An additional benefit in the kitchen and bathroom is being able to have the warm look of wood without the fear of water damage. The tiles are tough and stand up extremely well in high-traffic areas. You also won't have the problem of bleaching in areas that receive a lot of sunlight though sliding glass doors. Additionally, if you live in a humid climate, ceramic tiles that look like wood are a great choice. There is no need to install felt pads underneath your furniture to protect this variety of flooring, either. Generally, ceramic tile that looks like wood is less expensive than hardwood flooring. Like most things, there is always a range in pricing. You can expect to pay about $2-7 per square foot. It is always a good idea to purchase 10-15 percent more tiling than you need to allow for cutting, errors or accidents. Since ceramic tile that looks like wood has only recently begun to gain popularity, it's a good idea to shop around. While some large home improvement retailers carry tiles that look like wood, you may find more choices online. Cost will also depend on if you plan to lay the tile yourself or hire a tile contractor for the installation. When you are laying the tile yourself, you will have to figure in the cost of adhesive and/or grout (if you are tiling a kitchen or bathroom). Also, if a tile becomes chipped, it is possible to lift the tile and replace it, which is much harder to do with wood flooring. So costs of any needed repairs would likely be far less. Does it really look like wood? In a word: yes. Depending on how well the tile is laid, it's hard to differentiate between hardwood flooring and ceramic tile that looks like wood. For areas where you need to use grout, make sure the grout is as dark as the darkest tile you have for a more natural appearance. Explore the various types of tile available for your project. If you think you want to go the wood route, investigate cork and hardwood options and compare.